On Monday night, I attended Alive in the World In Concert: A Benefit for the Twin Towers Orphan Fund. Roommate Kelly has worked with this production for a couple of years in its many iterations and this time around, I was lucky enough to watch the songs as performed by the phenom Lea Michele from Spring Awakening, Adam Pascal from the original cast of Rent and several other very fabulously talented Broadway folks. I know these sightings won't mean much to those of you who don't give a hoot about musicals, but it was a pretty big night for me. I almost fell down when Jonathan Groff and Lilli Cooper walked in to support their Spring Awakening castmate. OMG, I said, as I shoved some complimentary choco-covered espresso beans nervously into my mouth. Then I saw the psychiatrist from HBO's Tell Me You Love Me. OMG, it's May! More espresso beans. 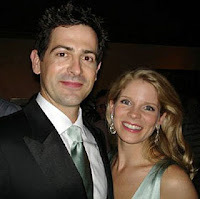 Two-time Tony nominee Kelli O'Hara was there to support her hubby Greg who is also in the cast. I first saw Kelli's performance at an Alive in the World preview last year and she's just too good for words. Espresso beans, espresso beans, espresso beans. Since I don't drink caffeine, I was whacked out of my brain. Completely wired, I told Kelly I was going to start singing in the midst of the Broadway crowd. Her mortified expression was priceless. Alas, my final awesome sighting is slightly less awesome because I can't figure out who the woman is. She's British, I believe, and she plays the shrill, older English know-it-all quite frequently. She's not anyone super easy to identify like Judy Dench or Julie Andrews or Helen Mirren. For the life of me, I can not remember one film or television show she's been in, and yet I immediately recognized her as someone when I heard her speaking to a man behind me. I turned around and confirmed she was in fact 'someone,' but I am just not sure who exactly. To that end, I must issue a Big Apple Angie challenge. The first person to correctly help me identify the British actress wins a prize! Perhaps it's Starbucks gift card, perhaps it's a bag of choco-covered espresso beans or it might be a yacht. There's really no way to tell at this point, but I promise you a gift (as long as you live in the U.S. - yachts are tough to ship abroad.) If you think you know the answer, please comment! 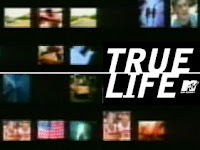 After one more giant handful of espresso beans, Kelly and I went home to watch roommate Amy's MTV True Life: I'm getting out of prison episode. You can catch it here at http://www.mtv.com/overdrive/?id=1579396&vid=203282. Needless to say, I was up all night thinking of Broadway, prison, hottie Jonathan Groff, May's crappy advice and how I should have laid off the espresso beans. wow you have awesome roommates that take you to cool places! I wish I had an amazingly cool roommate like Kelly! :) WORD!